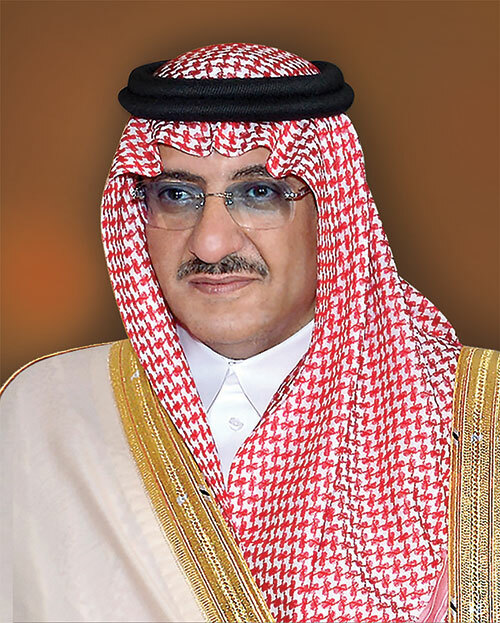 His Royal Highness Prince Mohammad bin Naif bin Abdulaziz Al-Saud was appointed Crown Prince and Deputy Prime Minister by the Custodian of the Two Holy Mosques King Salman bin Abdulaziz on April 29, 2015 and Minister of the Interior by the Custodian of the Two Holy Mosques King Abdullah bin Abdulaziz on Nov. 5, 2012. Prince Mohammad was born in Jeddah on Aug. 30, 1959, a son of the late Crown Prince Naif bin Abdulaziz Al-Saud, Deputy Prime Minister and Minister of the Interior. He began his education at the Model Capital Institute in Riyadh, and received a Bachelor of Arts degree in political science in 1981 from the United States. Prior to joining the Ministry of Interior in 1999, he was in private business. He received advanced law enforcement and counter-terrorism training in the U.S. and the United Kingdom. The Custodian of the Two Holy Mosques King Fahd bin Abdulaziz appointed Prince Mohammad Assistant Minister of Interior for Security Affairs on May 13, 1999 and, on July 22, 2004, he was appointed to the rank of minister where he oversaw the implementation of the Kingdom’s successful counterterrorism campaign. Prince Mohammad was instrumental in setting up the Mohammad bin Naif Counseling and Care Center in 2006. He was named Deputy Minister of Interior in 2012. He survived a number of assassination attempts, including one by al-Qaeda in the Arabian Peninsula in 2009. Prince Mohammad is a member of the Allegiance Council, the National Authority for Combating Drugs, the Supreme Economic Council and the Supreme Council for Media. He also chairs various committees; including the Supreme Hajj Committee, the Supreme Commission for Industrial Security, the Supreme Council of King Fahd Security College and the Supreme Council of Civil Defense. Prince Mohammad holds honorary positions as president of the Council of Arab Interior Ministers, the National Association of Retired Persons, the National Commission for the Care of Inmates, Released Prisoners and Their Families (Trahom) and honorary president and chairman of the Department of Naif Arab University for Security Sciences. He also chairs various humanitarian and service committees that provide relief from natural and man-made disasters, including in Lebanon, Palestine, Somalia, Syria, Afghanistan and Pakistan. Prince Mohammad enjoys swimming, horseback riding, and hunting. Prince Mohammad is married to HRH Princess Rima bin Sultan bin Abdulaziz. They have two daughters, Princess Sarah and Princess Lulua.